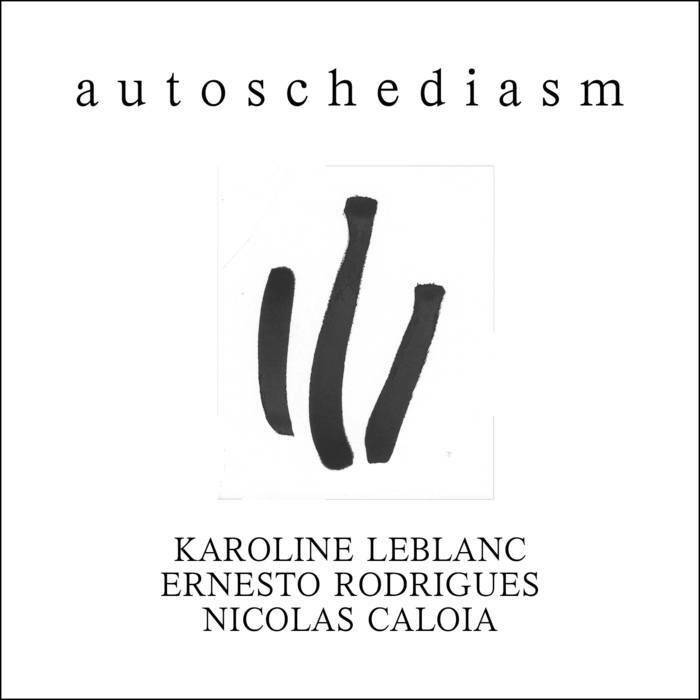 A release from the trio of pianist Karoline Leblanc and double bassist Nicolas Caloia, both of Montreal, and Portuguese violist Ernesto Rodrigues, Autoschediasm, recorded in June at the Conservatoire de Musique de Montréal, is an example of discerningly improvised timbral polyphony. From the first instant Leblanc, Caloia and Rodrigues reveals themselves to be possessed of a fine collective chemistry based on keen listening and sensitive responsiveness. Each leaves adequate room for the others’ instruments to breathe and to sound; their music is the product of what appears to be an unforced, natural rapport. As instrumentalists, all three are primarily colorists working with the full palettes that piano, double bass and viola make possible. 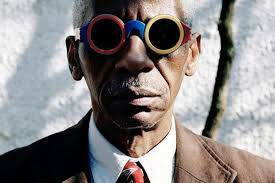 The group’s fluency in handling color is especially evident on the second track, an exploration of space and tone. The strings are particularly creative here, with Rodrigues spinning out a full spectrum of unpitched sounds against Caloia’s harmonics, plucked and struck notes, and pressure bowing. Leblanc’s discreet interventions serve as the keystone holding Rodrigues’s and Caloia’s centripetal forces in place. By contrast, on the first piece the trio craft a long but coherent improvisation on the basis of skillfully handled dynamics and a seamless blend of conventional and extended techniques. Leblanc is a deft player, playing inside and outside the piano as needed, and alternating lead and support–or simply staying silent–when the collective sound seems to demand it. Caloia gets a robust sound and provides a firm grounding with his powerful mid and lower registers; Rodrigues’s sense of texture comes out nicely in his use of rapidly bowed layers or plucked and tapped points of sound. Jazz Right Now’s best of 2018. The New York Times best jazz of 2018. Anti-Gravity Bunny’s Top 15 Drone Records Of 2018, all from women. I first encountered Earl Howard’s music in 1980 with his work V & T, which was composed for the violinist Shem Guibbory. I was greatly impressed by his command of texture and the subtle interaction between the soloist and the tape. Initially I felt the soloist was controlled by the tape music but the piece fostered a nuanced performance with a refreshing attention to detail within a relatively restricted musical realm. I felt a connection to this new music because it resonated with my desire to create ensemble music in which compositional aims could be achieved through directed improvisation. I was pleased when he decided to create a new work for piano and tape, Particle W. Particle W was the beginning of a creative collaboration with Earl that continues to this day. IKUE MORI at the Stone (Dec. 11-15, 8:30 p.m.). This percussionist, electronic musician and full-scope sound experimentalist can create an entire world of sonic encounter using just her laptop. But she’s also endlessly adaptive when placed into a larger context, quick to find her niche in almost any kind of ensemble. In the coming week, she is in residence at the Stone, working with some of today’s finest improvisers: the guitarist Mary Halvorson and the trumpeter Nate Wooley on Tuesday, the pianist Craig Taborn on Wednesday, and various others through Dec. 15. ANNETTE PEACOCK at First Unitarian Congregational Society (Dec. 7, 8 p.m.). A genre-bender and a prophetic force in music since the late 1960s, Peacock is one of the most riveting — though overlooked — vocal performers in jazz. Her psychotropic albums of the ’70s are cult classics, with a style landing somewhere between Anita O’Day and Betty Davis, and she has remained active (though secluded) in recent years, putting out albums on her own record label, Ironic. Her New York performances are rare; this one, presented by Blank Forms and Artists Space, may be the only chance to catch her in the city for years. 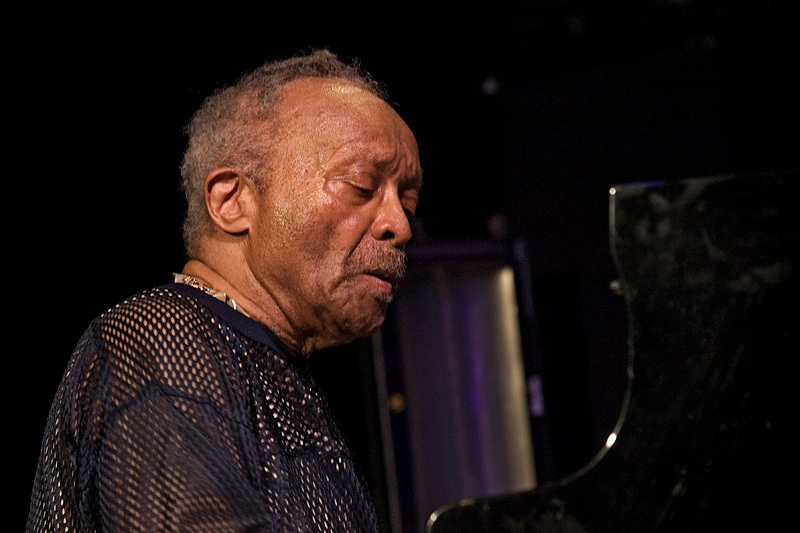 CECIL TAYLOR MEMORIAL at Roulette (Dec. 11, 7 p.m.). For the second week in a row, New York is mourning the loss of Cecil Taylor with a star-studded tribute concert. At this memorial event, presented by Arts for Art, the pianist and free-jazz pioneer — who died in April — will be celebrated with performances by dozens of musicians, including the drummer Andrew Cyrille, the pianist and multi-instrumentalist Cooper-Moore, the alto saxophonist Oliver Lake and the trumpeter Jaimie Branch. The year is drawing to a close, which means many of you are in the midst of frantically wrapping up your holiday season tasks. I feel for you. And it’s in that spirit of compassion that I bring to you one more thing for your to-do list: Ten jazz albums you definitely need to hear. Some of this music is the best you’ll hear all year. So put gift buying off just a little longer; sit down and listen to all of this beautiful music.